Let’s face it: Customers wield a remarkable amount of power over businesses these days. Sites like TripAdvisor and Yelp have revolutionized the way we consume. It’s great for customers because it organically increases competition among small businesses, producing a better overall product for consumption. But it can be good or bad for businesses because there’s no need for accountability from customers. They can say whatever they want. Did you know an uptick from 3.5 to 4 stars can lead to a 19 percent increase in peak-hour bookings at a restaurant? That’s the power of ratings and reviews. Unfortunately, the opposite is also true. Bad reviews can be a sinkhole for sales. 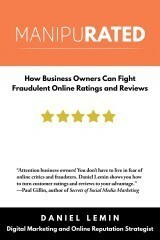 Your business can be lambasted on online rating-and-review sites. This ongoing dynamic led me to research and write my new book, ManipuRATED, in partnership with Convince & Convert. You might get a scathing review by a customer who didn’t like your “tone.” Or maybe receive a one-star review because a certain wine was out of stock. Or perhaps a customer was in a bad mood because of the weather. No matter the reason, the underlying mechanisms of the industry have left business owners feeling manipulated and misled. How do you fight back against these types of negative ratings and reviews? By having a solid, proven game plan. Buddhism teaches that one can only obtain enlightenment by separating themselves from their ego—it just so happens that the same thing holds true for combating negative reviews. Negative reviews can fill us with bloodthirsty rage. But if you take even one of them personally, your emotions will cloud your judgement and you will act irrationally. No good can come of this. Instead, try to relax. A negative review will not sink your business. In fact, they can even be good for business. NYU Professor Panagiotis Ipeirotis speaks about something I call “The Perfect Review Sandwich.” While too many bad reviews are bad for business, a few select (especially irrational) negative reviews can actually give you more credibility. No, they see the business as legitimate. Places with fifty 5-star reviews and not a single one below four stars? Seems a little shady, especially with the growing demand for fake reviews. But one terrible review in a sea of positive ones? That’s where I’m going for dinner tonight. Once you’ve managed to rein in your temper, it’s time to take the next step: Respond smartly to complaints. Why should you respond to negative reviews? For starters, customers expect it. In fact, 42 percent of consumers complaining in social media expect a response in 60 minutes or less. This is because, unlike you, they allow their emotions to drive their actions. Once those emotions have dried up, so does how much they care that their hash browns came out burnt. However, their negative review will stay on your rating-and-review site for eternity. Responding not only helps pacify an angry customer, it can turn a friend into a foe. Respond, and you’ve got a 20% chance of converting mad customers into fans. Don’t respond, and those odds go down by 43%. By responding to your reviews (both positive and negative), Yelp actually ranks you higher. Businesses that care about customers should be rewarded, and this is Yelp’s way of rewarding such businesses. So now that you’ve responded with a cool, level head? Well, don’t just sit there—fix your flaws. Yes, sometimes customers are just having bad days. But you’re not perfect, and neither is your business. Listen to your customers, and see what they have to say. Sometimes, your biggest grievers are actually giving you great constructive criticism. Take positive steps to better your business in the areas where you’re weakest. Will you be able to fix everything? Probably not. But a positive attitude and outlook can be a game-changer for your online reviews—and your overall sales.